BREAKING NEWS: Another Seiyuu Appears at Hawaiian Anime Convention, and Takeuchi and Togashi Dominate List of Anime That Need A Reboot! Hideo Ishikawa to Appear at Kawaii-Kon! Honolulu’s Kawaii-Kon made their final announcement of Japanese Guests of Honor this morning, and on this list is seiyuu who has had much bigger roles in other anime, but did play some small ones in Sailor Moon. Hideo Ishikawa will be making his first non-Japanese appearance at this convention, and plays Itachi Uchiha in Naruto, Jushiro Ukitake in Bleach, Auron in Final Fantasy X, X-2, and Kingdom Hearts 2. He had a few one-off roles in Sailor Moon, playing a driver in episode 73 and a man in episode 79 (R-season), a reporter in episode 143 and Tobikiriyarou in episode 155 (SuperS-Season). Yes, these are smaller roles, but in our endless pursuit to bring you everything we possibly can to do with Sailor Moon, this does qualify. More than that, Hideo was also part of a band known as the Entertainment Music Unit (E.M.U.) which included other stars of Sailor Moon, Hikaru Midorikawa, Ryotaro Okaiyu, Daisuke Sakaguchi and Nobutoshi Canna (formerly, his last name was (Hayabashi). Kawaii-Kon takes place from April 16-18 and if any of our readers are planning to attend, we would love to hear from you! ☽Hikaru has played both Fiore in the Sailor Moon R-movie, and Ail in the first part of the Sailor Moon R season. ☽Ryotaro played Tiger’s Eye in the SuperS Season, Yuuji in episode 2 (first season), Achiral in episode 81 (R-season), and George in episode 108 (S-season). ☽Daisuke played a cat in episode 31 (First season), a boy in episode 105 and a young man in episode 93 (S-season), and Chibi-Usa’s classmate Kyuusuke Sarashina in the SuperS season. ☽Nobutoshi played a guard in episode 20 (first season) and an official in episode 50 (R-season). 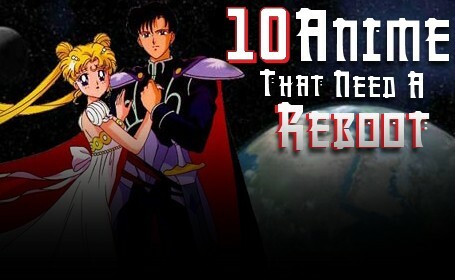 Naoko Takeuchi and Yoshihiro Togashi Dominate Mania’s list of Top 10 Anime Series that Need a Reboot!